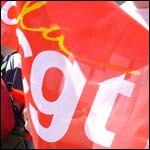 TWO new days of strike action have been announced by unions in France - Thursday, October 28 and Saturday, November 6. The new protests come as the government increases the pressure in Parliament to squeeze through the legislation by the end of the week. In a statement on the CGT union website, they highlight the support amongst the public that is being revealed in opinion polls for their opposition to plans that would raise the minimum retirement age from 60 to 62. Unions are calling for a public debate on the changes and blame the government for the continuing protests and problems the public currently face.